by Monroe Fritz. Outskirts Press, 2013. Whether an historic building or a contemporary one, most faith communities have a lot to learn about how to make their sacred space more energy efficient and cost effective. 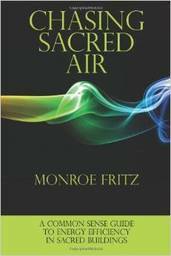 In Chasing Sacred Air, Monroe Fritz translates some of the cutting-edge science behind how to make buildings of all types more energy efficient and provides practical, understandable and doable steps toward that goal. More than that, he does so with insight and sensitivity to the unique culture and conundrums that congregations face with their sacred space. Fritz has vast experience in performing energy diagnostics, certifications and testing in more than 7,000 churches, homes, commercial and institutional buildings. He draws from this experience as he outlines practical solutions to save energy and money. Included in the book is a description and discussion of the pros and cons of having an energy audit. For anyone who is part of a worshiping community and wants to help improve energy efficiency, save money and be good environmental stewards, this book will provide well-rounded and uniquely devised solutions.